A new novel cover for Charlesbridge Publishing! It is going to be released August 1, 2013. Many thanks to Whitney and team for the opportunity to work on this and to Leah Pileggi for writing such a poignant story. Ten-year-old Jake Oliver Evans is the newest – and youngest – inmate at the Idaho Territorial Penitentiary. It’s 1885, and he’s been sentenced to five years for shooting a man who had threatened his pa.
Alone in a dark cell at night and ordered to muck out hog pens by day, Jake makes the most of prison life. A boy among men, he refuses to be bullied by hardened criminals and lifts the spirits of the inmates who befriend him. Mostly, though, he’s just happy to be fed. But when Jake finds himself caught in the center of an explosive escape attempt, it becomes clear that a penitentiary is no place for a young boy. 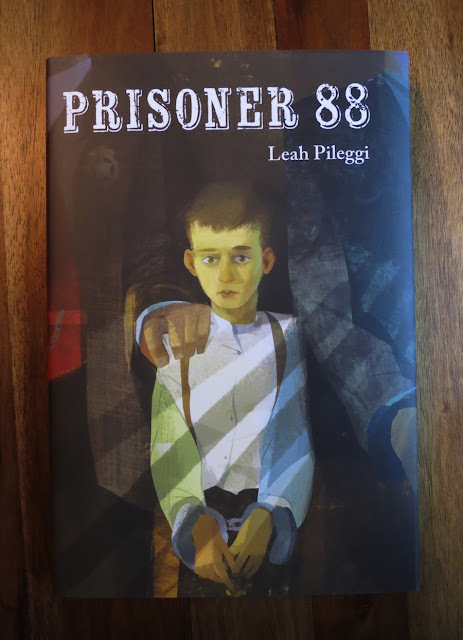 Inspired by an actual ten-year-old boy who served time in the Idaho Territorial Penitentiary in the 1880’s, Prisoner 88 tells the story of a courageous boy who faces danger and finds friendship under the most unusual circumstances.